Ethan and I walked down to the library Sunday and forgot the don’t open until 2, since we had some time to kill and were hungry, we decided to check out Framingham Sub & Pizza. The place is small but has plenty of tables, although no one else was in there. We got a small cheese pizza and waited about 10-15 minutes until we were called up to retrieve it. The look and taste of this was what reminded me of skating rink pizza. Which is okay when you’re 12 and just grabbing a slice in between songs but we found this to be disappointing. It was almost like it was made from a kit. I don’t know how else to describe it. I know everyone has bad days so maybe this place was having one, but I don’t know. I would actually come back and try their subs though out of curiosity. 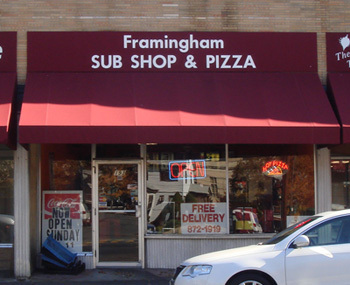 I know exactly what you mean about Framingham Pizza & Sub Shop. I’ve taken out from there several times just because of the convenience- I can stop there on my way home from the church. My biggest complaint is the DOUGH. It tastes like a combination of chalk, paste, and card stock. My wife thinks Anastasia’s pizza is way too greasy. Well, Anastasia’s IS kind of greasy, but it IS better than Framingham Pizza & Sub Shop! 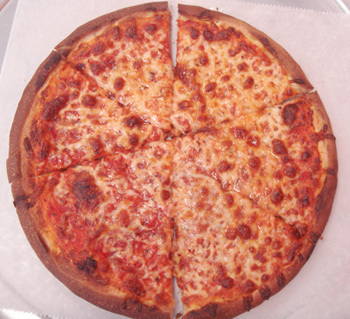 It seems like there are a lot of bad pizza joints in Framingham. We live within a quick walk from 3 pizza joints, 2 lousy, 1 fantastic (Gianni’s). The few others I’ve tried have also had nasty crusts. I think, hands down, Gianni’s is the best. I go to college with a guy who comes all the way out from Roslindale, and he likes it compared to all the other pizza joints in Framingham. Don’t get me wrong, any pizza is good if you have to be on the go, but Gianni’s just creams most of them. If you’re ever in St. Louis though(now you know where I used to be from) then Stefanina’s pizza is the best, for St. Louis Style, of course. Besides my mom, brother, and sister, I miss that pizza, and I would hope that would speak volumes if one of you gets stranded over there via layover or what not. Anyway, keep up the good blog! I find it hard to believe that people like this kind of cardboard crust, factory-like made pizza. You find this same pie all over Framingham. They are all the same and all still in business, so I guess some people don’t know what a good pizza actually tastes like. There is a high concentration of good pizza in Boston and many in CT, where I grew up, but this area is a dry, cardboard, nasty pizza zone!